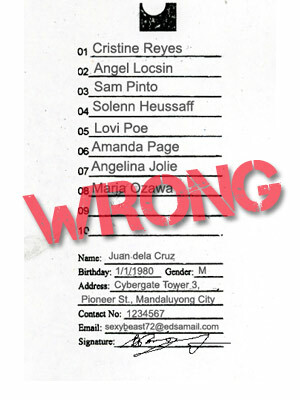 Some Clarifications on FHM 100 Sexiest! To say that this year's FHM 100 Sexiest is exciting is an understatement. You're really showing awesome support and love to your ladies — thanks! But, there seems to be some confusion. Oddly enough, it is with the good old traditional ballot that people seem to be having a problem with. We don't want your votes getting wasted so allow us to state again the hows of voting. Online, you can cast your vote once a day here. A ballot has ten (10) slots you can fill that up and vote for 10 ladies. You have to be registered and logged in to do this so if aren't yet, swing by this link and register. Via mobile, type iFHM VOTe and send to 2640. Each SMS vote will cost you a mere P2.50 but each SMS is equivalent to 5 votes. 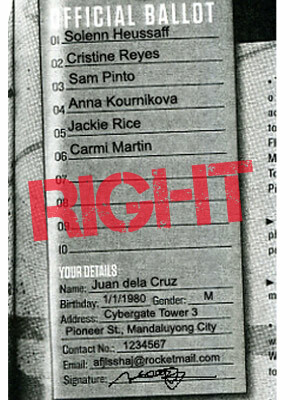 Via ballots, please remember that FHM has been printing official ballots and publishing them in the magazine. Please use those; you cannot invent, fill out, and submit your own. Intiendes, amigos? Bien. That said, keep your love coming! You have three weeks left to put your lady love on top. On a side note, we've been keeping you posted on the running tally every week via our bullpen. You just have to sign up and you'll be privy, pronto. Don't worry, too, because simply put, our bullpen rocks. We've just seen the latest tally and is it's exciting so if we were you, we'd sign up, right now; because we're just about to send this week's in a few. Hope this clears a lot of confusion.